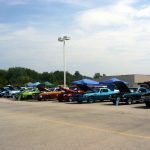 John – Welcome to the WCC forum and thanks for rating the Pardeeville Community Car and Truck Show! Unfortunately, your truck is in too narrow of a niche to expect a separate class at most shows, to include even the largest shows of the year. I would suspect that you had the only 4X4 heavily customized, new truck at this show. I did not judge your class, but I remember seeing your truck at the show and thought that it was done very nice. And, in looking at the classes offered, it appears that you were placed in the right class. You did notice that Pardeeville awarded two extra awards in your class for a total of five Best in Class awards? Did you notice that at least one, possibly two trucks, received awards in your class? I would encourage you to rethink your decision and come back to Pardeeville next year and compete again. Also, you should contact the organizers of the show and request a copy of your judging sheet, to see how your truck actually scored. For what its worth, I have a pretty nice collector car also, and I have competed at Pardeeville every year, since the very beginning. I have won one (1) Best in Class award during those eight years. My point is, it’s a big show with over 500 very nice cars and trucks (most years) competing for awards. It is unrealistic to expect to do well at this show every year.